and see a thing I do. 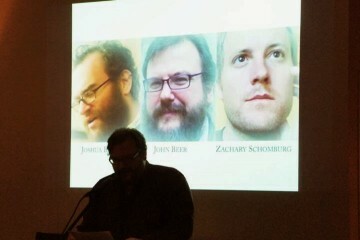 Last Sunday’s event was an evening of three fantastic Northwest poets: Zachary Schomburg, Joshua Beckman and John Beer! Zachary Schomburg read from his newest manuscript, “Agnes the Elephant.” Schomburg participated in Poetry Press Week on Nov 6, which you can read more about here. He holds a PhD in creative writing-poetry from the University of Nebraska, and his publications include: The Man Suit (2007), Scary, No Scary (2009), and Fjords vol. 1 (2012). Schomburg was the winner of the 2013 Stafford/Hall prize for poetry for his Fjords vol. 1.John Beer read a few pieces from The Waste Land and Other Poems (2010), which won the Norma Farber First Book Award. A graduate of the Iowa Writers’ Workshop, he teaches in Portland State University’s MFA program. Joshua Beckman read selected works from The Inside of an Apple (2013). He is the author of over nine books, and is also an editor at Wave Books. Just before the event, he led a workshop on “Gathering Attention” at Literary Arts. John and Joshua also read selections from Robert Lax Poems 1962-1998. John Beer edited the book, which was just released from Wave Books. 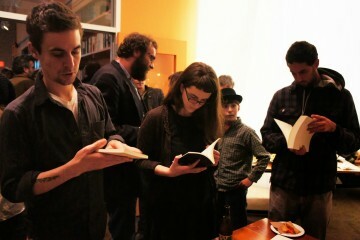 Thanks Zachary, Joshua and John for joining us for another memorable night of poetry.